In previous semester I had the honor, and pleasure, of supervising a very talented group of students. The venue, is a hands-on course in research where the students should bring into action all the theoretical knowledge they accumulated from previous years - from theory-driven hypotheses to the statistical definition of H0 distributions across their data. As for a research domain, the guidance was to form a research question that could be hosted under the flexible roof of the cognitive sciences while stressing external validity (we called it "cognition in the wild"). The students, very talented but not without a sense of humor, decided to study a question which is apparently at the heart of the Jerusalem-student-pop-culture: which Tahini brand is truly the best? or rather - how our preferences, specifically preferences of low-level sensory stimuli, are shaped? 150 surveyed subjects and nights of statistical processing later, we now know the answer. As part of our B.A studies, we were granted the opportunity to examine an interesting cognitive question of our choice. After a short deliberation we all agreed that there was only one thing that we all desperately wanted to know - what tahini is the best? And you must understand - tahini is fundamental. As students, tahini makes the great majority of our menu. Tahini can save a bad sandwich, it can upgrade significantly any dinner - be it vegetables cooked in an oven, schnitzel, falafel, salad or pretty much any meal. Tahini is accessible, easy to prepare and constantly features in students' dinner parties. And there's also a great expertise associated with tahini making. A good tahini maker, a tahini-barista if you will, knows just the right temperature, how much water to add, the exact color of the lemon from which a juice squeezed into the raw tahini, and the careful mixture of spices and herbs that should be added top optimized the whole tahini experience. Naturally, many different tahini brands are present in the market. This great variety of brands is the subject of an endless debate between students regarding the identity of the absolute best tahini; and like the best beer, soda or car-brand, these debates never lead to an ultimate consensus. While some brands are considered great or just okay, the elusive question of which is the best tahini, forever remained undecided. But behold, this is where we step in. When pondering this question ourselves, we stumbled upon an interesting phenomenon – although most of us hadn’t tasted all brands, we all had solid opinions about their taste and quality. This fact made us think - how can we have such a clear opinion about different types of tahini without even tasting them?... Horror crept into our hearts when we thought that maybe our preference for tahini is not only a function of its taste. Perhaps our preferences are influenced by other irrelevant factors. Our hypothesis is that the brand of the tahini is such a factor. For example, we assume that store brands are perceived as less tasty, regardless of their taste. Therefore, we wanted to test and see - Does the brand of the tahini have an impact on people's preference? Could it be that the best tahini is actually a simple underrated store brand? Or is the student’s perception of branding compatible to the taste of the tahini? In order to answer the question, we wanted to compare different brands of tahini with regard to brand preference and taste preference. We cannot compare all kinds of tahini because it would take a very long time, and despite the tremendous impact of this research on the lives of millions, there are other things we like to do in our spare time. Instead, we chose to feature three brands that we all agreed on their ranking compared to each other. First - one of the brands that is often considered the best among students, the favorite heading in, it's "Har-Bracha". "Har-Bracha" is definitely a fan favorite and we wanted to see if its positive reputation comes from the right reasons. The next competitor had the ability to be the dark horse of the competition - "Barake". While not having as strong reputation as "Har-Bracha", this brand definitely has its fans. We wanted to see whether "Barake" had what it takes to rise to the top or would it fall short compared to the other brands. Last but not least we chose to feature the store brand- "Shufersal". There is nowhere to hide, "Shufersal" was the clear underdog going in. As a generic store brand, it has the smallest fan base, and is rarely brought up as a contender for the best tahini. We planned an experiment to test and determine- which tahini is the best? What impact does the branding have on people’s preference? Will "Har-Bracha" prevail and justify its status as one of the best or fail to deliver? Could this be the break "Barake" needed, or the proof that it doesn't belong in the best tahini discussion? Will "Shufersal" the underdog surprise us or fall as predicted to the bottom of the ranking? May the best tahini win! ​Afterwards we prepared the tasting trails. We set up tahini stands next to campus’s library, fishing for passersby and making them taste and rank the three tahini. Importantly, we repeated the experiment two independent times (same venue, different dates) with one major distinction: While at the first experiment the brands of tahini were clearly visible, in the second experiment they were not. Luckily the starving students jumped at the opportunity to participate in the once in a lifetime experiment, not very surprising given the love of students for free food and for tahini in particular. Anyway, in spite of dismal predictions of having to collect data over months upon months, we got all the data we needed in 15 minutes - 57 in the revealed stand and 65 in the blind. ​At first glance, the results do not show huge differences between the taste ratings in the two different conditions (blind vs. revealed brand). Indeed, when we performed a statistical test (t-test for independent samples) between the ranking of each tahini in the blind test and in the revealed test, we found no significant difference (n revealed =57, n blind =65, df=120, p>0.05). 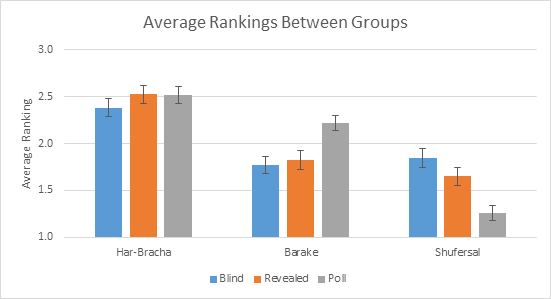 One can also see in the second graph that in both groups, "Har-Bracha" was ranked first as the best tahini (second graph, green bars). We did, however, notice that the rating of the "Shufersal" tahini rose significantly when the subjects tasted the tahini compared to the dry questionnaire (first graph, right bars). In addition, when comparing the tahini of "Shufersal" with the tahini of "Barake", it became apparent that the average rating of "Barake" is higher than that of "Shufersal" both in the questionnaire and in revealed test, where the brands were exposed, while on the test when the brands were hidden, the ranking was reversed, but the difference was not significant (second graph blue and yellow bars). Lastly, we performed a statistical test (Chi-square for Independence) to see if the subjects' preferences were significantly altered between the revealed test and the blind test, and voilà! we found a marginally significant difference between the ratings in the two conditions (n revealed =57, n blind =65, degrees of freedom =8, p=0.054). Overall our results show that there are small differences between subjects’ preferences when they see the brand and when the brand is hidden. We saw that "Har-bracha" is ranked in the highest place in both groups, so it seems to be really tastier. On the other hand, the rating of the "Shufersal" was different in the different tests, which suggests that the cause for its low ranking in the open questionnaire is the branding rather than its taste. Given the proven effect of branding on preference and the solid opinion of students regarding the ranking of tahini even without tasting, the results are quite surprising. We expected that the brand would affect the preferences so that the tahini ratings would be very different in the open test compared with the blind test. In practice, we did not find any significant differences between the two groups. We offer a few possible explanations for the lack of significant differentiation between the two groups. 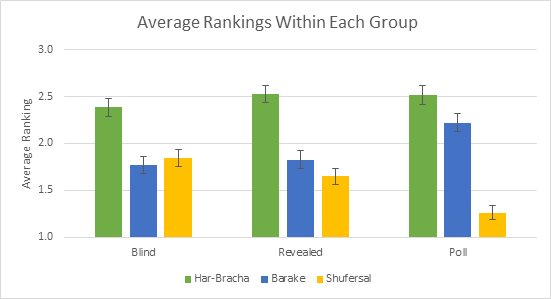 The first, straightforward, explanation is that indeed the stereotypes hold true- “Har-Bracha” is the better tahini and the participants were consistent in their ratings accordingly. However, in science it is important to consider alternative explanations. The first alternative explanation is that students from Givat Ram (where we performed the study, and where we study– best campus ever) are simply superior to the general population. Along with their advantage in intelligence, creativity, social skills, internal and external beauty, tennis and other gymnastics skills, they are also resistant to the effects of branding, and have a most accurate, sense of taste. A second alternative explanation is that the effect does indeed exist in the general population however, we inadvertently surveyed an expert-population in which this effect is not manifested. 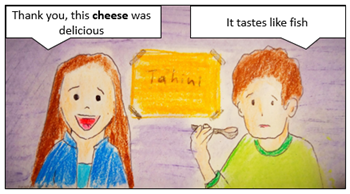 It seems that the opinion of the surveyed students about the ranking of tahini is derived from a deep and meaningful acquaintance with tahini. They know from experience which tahini is tastier and therefore there is no significant difference in taste ratings when exposed and not exposed to brands. In our opinion, it would be interesting to repeat the experiment. Specifically, to test audiences that are less familiar with tahini and see if their taste ratings will be affected by branding. In conclusion, this research provides strong evidence that lays a scientific rational to an already heavily reinforced behavior, that could have been otherwise suspected as irrational – we will keep on paying more for our favorite, branded tahini as it is now scientifically proven, that it just tastes the best. Seems like everywhere you turn one hears about the replication crisis in psychology (and science in general). We discussed the subject recently - and here is a short introductury presentation I made on the subject to promote the discussion.